Yorkshire fabricator Dempsey Dyer has gone the extra mile to help a valued customer complete a lucrative job in an Oxfordshire conservation area. Respected local installation firm Windmill Windows had been called on to refurbish a property in a historically sensitive part of the county. 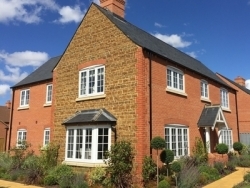 Together with the homeowner, the company decided to replace the existing windows with Deceuninck’s heritage flush sash – a high-spec uPVC window system designed to replicate the appearance of timber. However, the project hit a problem. While impressed with the Deceuninck product’s period detailing, Oxfordshire conservation officers rejected it, arguing that its astragal bar was too wide, and not sufficiently timber-like, for use in a conservation area. That’s when Dempsey Dyer, Windmill’s trade supplier, came to the rescue. The fabricator collaborated with astragal bar specialists the Georgian Bar Company to produce a version of the Deceuninck Flush Sash that would meet the strict standards of the Oxfordshire conservation office. Outfitted with a slimmer astragal bar, the products were given the go-ahead – allowing Windmill to bring the project to a successful conclusion. “All conservation areas are different – and products that might satisfy some conservation officers might not convince others,” commented Peter Dyer, Dempsey Dyer Managing Director. “Deceuninck’s Flush Sash is an outstanding product, offering sleek slimline frames, traditional ironmongery, and optional mechanical joints – but in this instance, Windmill Windows were up against a particularly demanding conservation office. “When customers find themselves in circumstances like these, at Dempsey Dyer we’ll do everything we possibly can to help.